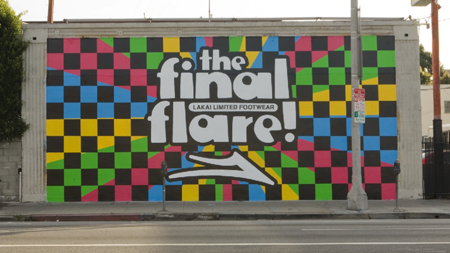 So the long awaited, Final Flare Lakai video, is finally up for purchase. Now you can check out all the bonus goodness that comes along with it. On top of that, you get the Blu-Ray disc that comes along with it. This is the perfect item arriving at the perfect time of the year. It’s raining over here in the Valley and snowing in many other parts of the United States. Since we can’t go out and actually skate, and since there is no indoor park over here in the Valley, watching the Lakai Final Flare DVD sounds like the perfect plan. According to the Lakai website all the DVD’s shipped out Friday and whatever didn’t get shipped out on that day went out this past Monday. So your local shop should have them in stock by now. And by all means, try to get it at your local skateshop and support your scene. Get the Lakai video and get yourself pumped up to skate when the weather clears. Looking out at the rain right now reminds me a lot of Marc Johnson’s entrance trick to 3rd and final song of his part. Right when he looks into the camera and says “See those little dots right there Ty? That means its raining.” And then he commences to do a lipslide to blunt on these two gnarly benches all while it is pouring rain around him. Classic. Check out the Lakai site for more details! 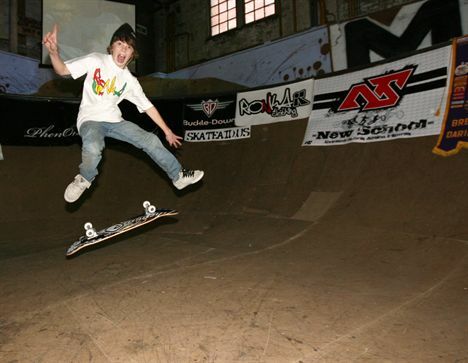 The most consecutive kickflips on a skateboard is 1,546 and was achieved by Zach Kral (USA) at 4 Seasons Skate Park, Milwaukee, Wisconsin, USA, on November 30th, 2008. That is the official release from the dudes over at Guinness World Records. He beat the previous record holder Christian Brekke who had a total of 1424 kickflips. First off, props to Zach for shattering that record and secondly props to the guy who counted all of them. Wow! Zach is only 14 years old and is already shattering world records. And as crazy as it sounds, you can count on Zach to hold down the record for a while. He had once previously held the kickflip record only to loose it and now regain it again. So you know there are heads out there attempting to one up him. And thus, the never ending battle for the most consecutive kickflip record begins. But honestly, if Zach could pull off 1,546 kickflips in a row I see now reason why he couldn’t pull off 2,000 if he had to. Big ups Zach, Congratulations and give us all some kickflip trick tips! Remember kids if you ever decide to try and play Zach at a game of skate don’t even bother with the kickflip. You won’t faze him. Stylish and underrated skateboarder, Nate Broussard, has now officially found a board sponsor. His previous deck sponsor was Bueno, which was actually sparked by the same dudes as the now current Roger Skateboards. So it’s almost like nothing changed… but everything did change! If that makes any sense at all? Roger Skateboards has had this unique sponsorship program going in which they sponsor an individual for one month and then kick him off the team. This of course, will not happen to Nate Broussard. The dude is officially riding for Roger and you will be seeing a lot more from him in the near future. If you have never heard of Nate Broussard, you are missing out. I first saw him in Adio’s “One Step Beyond” video. Since then his entire style of skateboarding has changed and you can catch what is in my opinion, his best part to date in Static 3. His graceful push on a skateboard is by far an art in itself. The dude makes city streets look like an urban skateboard park. Watching him skateboard will make you want to go take your shred sled to downtown and cruise the streets. I would honestly rather watch Nate Broussard do one smooth line than see a thousand dudes throwing their carcasses onto giant rails and stairs. Watching his part in Static 3 right now got me so pumped that I can’t help but to go skate at this very moment. Flip skateboards has made the move from Blitz to another world renown distribution company NHS. It’s not really a surprise to tell you the truth. Most of the Flip riders already ride for Ricta Wheels or Independent Trucks. So there was already more of a connection from that alone. It’s still going to stay the same old Flip Skateboard company that it has been. The wood though, I am assuming will be changed the same as to that of the Santa Cruz and Creature boards. And of course their long awaited video will still drop sometime in the near future. About the only huge visual difference will probably be the added segments of Flip promos and commercials within NHS’s highly famous Strange Notes DVD’s. Which may I ad are pretty damn cool. And on a reverse note if I am not mistaken I believe JSLV clothing is now being distributed by Blitz. JSLV is a pretty rad company that definitely deserves to be getting recognition out there. I have been seeing it everywhere lately from television commercials to getting repped by butteryass Donovan in the Berrics. Both distribution companies have good things going for them and it’s all just a part of the on going change occurring all throughout the industry. The header says it all. 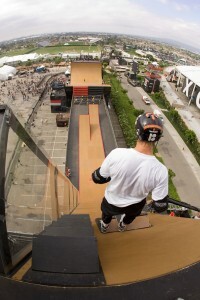 Danny Way broke two vertebrae in his back recently at the Oi Mega ramp contest in San Paulo, Brazil. According to sources, it has been said that he will be out for the next six months. Wow! Six months of no Danny Way? It’s going to be strange, not only that but the fact that he actually got hurt to a point where he cant skate for a while. I mean, the dude is indestructible. How many gnarly falls have we seen him take only to watch him get right back up and walk away as if nothing happened. Remember that gnarly X-Games mega ramp slam where he bounced off the coping like a rag doll? Danny ended up going back to the top and trying it again that same day. If you watch the recent video of his injury slam you will see that it actually doesn’t even look that bad. But with enough force aimed at the right spot, a lot can go wrong. Hope you get better soon Danny! We will miss seeing you defy the impossible and unthinkable. This also brings me to a quick side note. Have any of you seen the latest skateboarding part of his in the “Superfuture” promo? You have to see it. He does Bob Burnquist’s final trick from the Oakley video and throws it down like within the first 5 tricks of his part. On top of that, wait till you see him 360 flip manual on some manual pad from the mega ramp going like a zillion miles per hour. It’s ridiculous, your jaw will literally be dropped and make you feel like there is no hope of any of us ever attempting to become as good as he is on the mega ramp. 5ones: What have you been up to lately and what are your future plans? Eric Bork: Lately, I have been working at OGIO. I manage the skate program as well as our Key accounts. I work with accounts anywhere from Active to Best Buy. 5s: Describe a daily routine in the life of Mr. Eric Bork? EB: Daily routine – At work by 8:30 and I get home between 6 and 10pm. When I get home early, I work on my book. I want to take writing to a higher level than I ever was able to take my skateboarding. The only problem with skateboarding, was that when you get older, it fades, whereas, the older you get with writing, the more you learn and the better you get at it. 5s: What gets you super pumped to go out and skate? EB: These days, I get pumped to skate when I’m in the mood to bomb hills and play skate. EB: 26 stair crooked grind in bakersfield. Built the 20 foot flat bar that is now in the Berrics and crooked it 20 times for 2 weeks before. 5s: Advice to kids trying to get themselves into the industry? EB: If you live true to your beliefs, know where your talents lie and use those talents for other people’s benefit as well as your own, you’ll stand out and enjoy what you do no matter what industry you are in. Every other Sunday from here on out, till who knows when, you can look forward to watching some fun skateboarding from all the gang over at Struggle Skateboards. 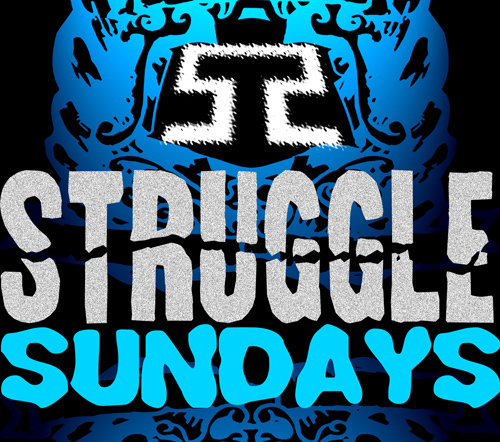 The web show is called Struggle Sundays and it follows the Struggle team and friends throughout their weekend skate missions, and of course all the antics that come alongside skating with the crazy bunch. All of this can be viewed on Firststoke.com and the first episode has two parts to it. Episodes following these will be taking place in different cities so who knows you might have some of the Struggle team somewhere filming in your hood in the near future. The show is about having fun skateboarding. Which is the most important thing by far. Basically so much footage gets filmed that doesn’t get used and this show gives it a home to send that to. On top of that, it’s pretty entertaining to watch and there are cool features within the show that are worth watching. For instance, there is a section in each show called the “Product Stash” in which a Struggle team rider takes a deck, shirt, or some kind of product and stashes it somewhere in the city mentioned. They give you a snapshot and hints within the video of where it was hidden. You go out and find it for yourself and you can basically come up on a new free complete within a few shows if you’re dedicated enough. On top of that, every episode features other artists such as musicians, graffiti masters, painters, photographers, and other extreme athletes who happen to be into skateboarding as well. December 6th is the next episode and the current one from this past weekend can be viewed below or on Firststoke.com. Thrasher’s 2008 skater of the year award goes to Silas Baxter Neal! Of course, how could I have forgotten how many covers this man has graced within the past year. 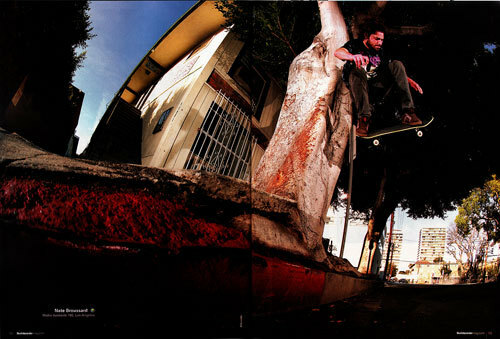 A gnarly full fledged part in the habitat video, and tons of ads and photos in countless magazines. Silas Baxter Neal isn’t your usual household name. You won’t find him competing in the Dew Tour or spot him making an appearance in any video game or television show. Silas Baxter Neal is the skater’s skateboarder. He is raw and 100% real and he is now officially our Thrasher Skater of the Year. Silas came in to the scene so fast. He had always been around but within the last year and even in 2007, he was stepping it up. 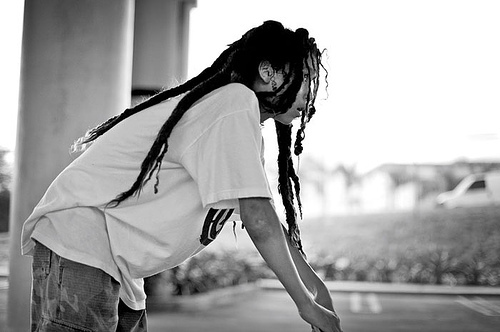 His exposure grew to tremendous heights and he let his skateboarding do the talking. Silas is from Oregon which may explain a lot of his gnarly terrain skills. There are so many amazing skate parks in Oregon and there is no doubt why an amazing skateboarder like Silas came out of there. And actually, the first time I heard of this guy, I seriously thought he was from the east coast or something. His style is quick fast and adaptive. He has a mean wall ride and the innovation he puts into his skateboarding is amazing. Congratulations Silas I am sure we will be seeing tons more from you in years to come. If you happen to live in San Diego, Ca, you are in luck. 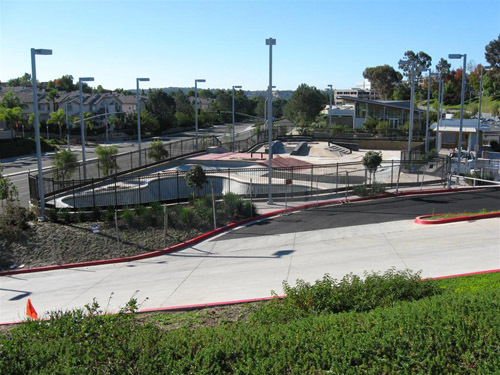 The long awaited Carmel Valley Skatepark is finally done and constructed. The grand opening will be held Saturday November 22nd at 12:00 pm. There will be a professional skateboarding demo for two hours and from 2:00 to 4:00 they will have their first ever open session to the public. The entire skatepark looks absolutely amazing and there are a lot of street influenced spots within it. Such as the granite marble like ledges which look buttery as heck. There is also a bricked like bank with what looks like a euro gap built in it. The rail going down the stair set is decent sized and overall the entire street section is pretty awesome. On top of that there is a massive bowl in the corner. There will be some heavy sessions going down at this skatepark. I have yet to see a marble ledge at a skatepark. Ever! So for me, that alone would sell me into making a trip up to skate it. It actually almost looks like a mini replica of the Downtown San Diego Marble ledge. There is also a little shack built aside from the skatepark. Perhaps it is a snack bar? Well that would be cool but more than likely its some sort of rent a helmet building. Not sure of all the rules set for the park yet. But you can check out the sweet website made by some local skateboarders there keeping you up to date on everything going on!